I have finally left Italy and am heading toward Mexico! I really enjoyed my stay in old Italy, and plan to revisit very soon, but time to back away from the pasta and red sauce and embrace a new land! So today we have Chiles Rellenos Casserole. An ‘easy on the cook’ version of a very tasty Mexican dish. It will feed 6-7 people or a small mariachi band. 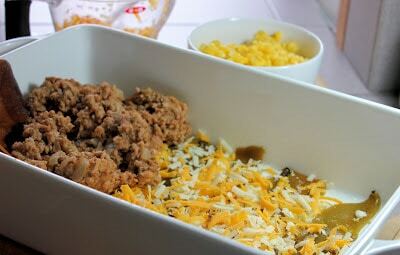 It is a fairly healthy casserole and for that reason, I will include the nutrition information. If you are watching your cholesterol, try an Egg Beater type product in place of the eggs to lower the numbers even more. 2 cups shredded Colby-jack cheese, divided. Preheat oven to 350 degrees. Spray a 9 x 13 casserole dish with non stick spray. 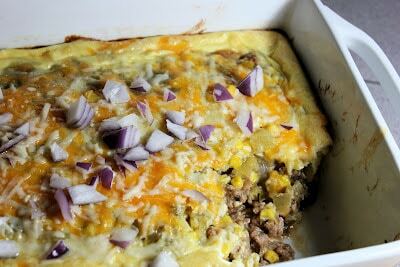 Cook ground turkey and onion in nonstick skillet until browned, stirring to crumble. Add cumin, oregano, garlic powder, salt, pepper and refried beans. Stir well (it’s gonna be a bit gooey). Arrange half of the chilies in the bottom of the casserole dish. 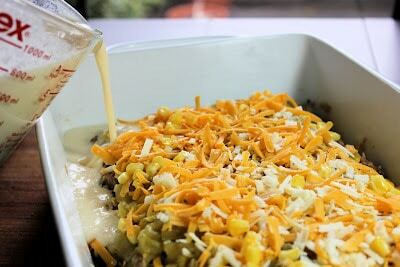 Top with one cup of the grated cheese. Spoon meat and bean mixture on top and spread to cover, leaving a one inch border around the edge (this is where the egg mixture is going to go…it’s own little beany reservoir!). Top with corn. Arrange remaining chili’s over corn, top with 1/2 cup cheese. In a separate small mixing bowl, combine flour, salt, hot sauce and eggs, and milk, stirring with a whisk until all lumps are dissolved. Bake at 350 for one hour, until the top is puffy. Remove from oven and let stand 5 minutes. Serve with diced red onion and cilantro. I’ve made this recipe dozens of times. It’s delicious and is a staple in my house. I use fresh poblanos peppers(blackened and peeled) which is more time-consuming but the results are wonderful. I love the meat and bean mixture. Thank you Alex! this was one of the first recipes I blogged and it needs a serious up-do in the photo department! So glad you like it! 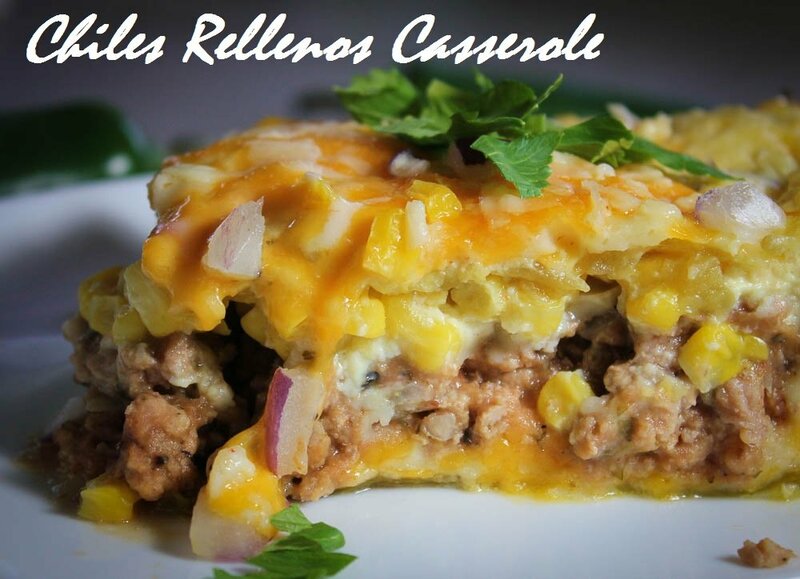 This is our favorite chili relleno casserole YUMMY! Thanks for the WW+ Points on this! SO helpful!